When did it begin, this avoidance of the stairs? It might have happened gradually over time, when pain, weakness or fear of falling began to make the thought of going up and down stairs simply not worth the effort or risk. Or it could have become an issue with a sudden change in health circumstances, such as surgery, that made the climb impossible and thus the other levels of the house inaccessible? 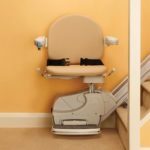 Would a straight stair lift be the solution? The most common type of stair lift is the straight stair lift, so called because it is designed to scale flights of straight stairs that have no landings, bends or curves. 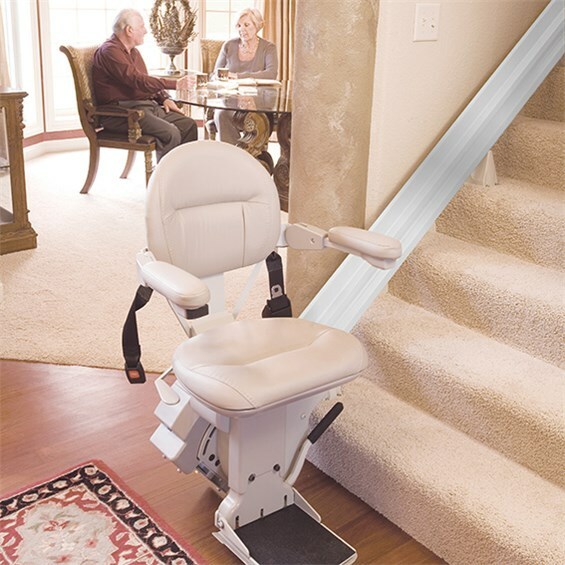 The straight stair lift makes moving from one floor to the next an easy – and safe – everyday event for people in north Georgia homes in communities such as Atlanta, DeKalb and Fulton. This stair lift is also typically the most affordable and simplest to install. Does your home have a straight staircase that you would like to utilize? 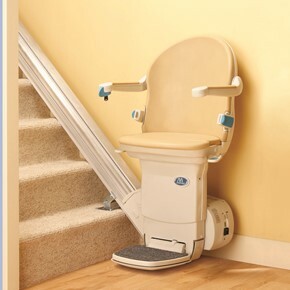 Call Stair Lifts Atlanta at 770.880.3405 for a free in-home consultation today. 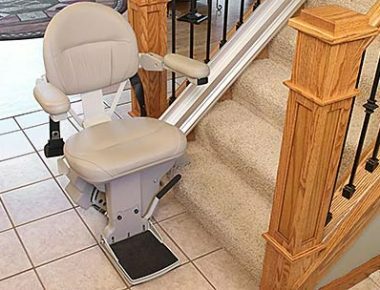 Consider your stairs – If your straight staircase runs to the next floor in one flight, the straight stair lift is a perfect choice. 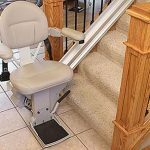 If, perhaps, your stairs are interrupted by a landing, two straight stair lifts might be used for the efficient, budget-friendly choice. Consider the size – It needs to be determined whether the standard size is adequate or if a heavy duty model should be acquired. It is very important to size to fit the primary user both for height and weight. Standard stair lifts can comfortably carry up to 300 pounds, whereas the heavy duty model supports up to 350 pounds and offers a wider, deeper seat. The more capacious lift needs a wider staircase for ample room for installation and function usage for homes across north Georgia, including Atlanta, DeKalb and Fulton. Consider the features – You may benefit from a swivel chair option, which allows for a comfortable seating without the precariousness of dangling over the stairs. Additional features include battery or electric operation, extra safety devices, digital display for performance status and even a call-send button designed to retrieve the chair from one level to another. 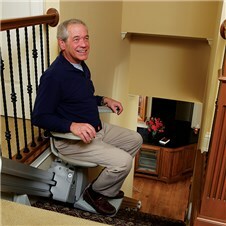 Not all stair lifts are created equal, however. 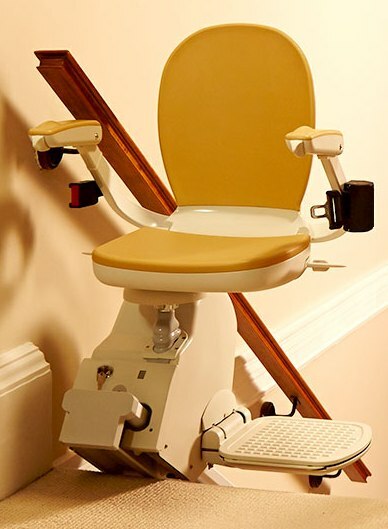 One highly reputable company is Acorn Stairlifts, which provides exceptional quality, affordability and customer service, not to mention optimum comfort and functionality, making the Acorn 130 Straight Stairlift an excellent choice for homes across north Georgia, including Atlanta, DeKalb and Fulton. Call Stair Lifts Atlanta at 770.880.3405 for a free in-home consultation today to get yourself one “lift” closer to confidently tackling those stairs again. How To Select a Stair Lift Part 1: Indoor, Outdoor, Straight or Curved? 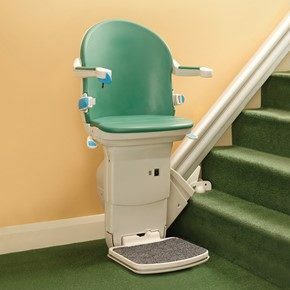 This entry was posted in Acorn Stairlifts, Stair Lift Blog, Straight Stair Lifts and tagged acorn 130 straight stairlift for atlanta homes, how to choose a straight stair lift for your home, indoor and outdoor straight and curved stair lifts, stair lift north georgia atlanta dekalb fulton. Bookmark the permalink.